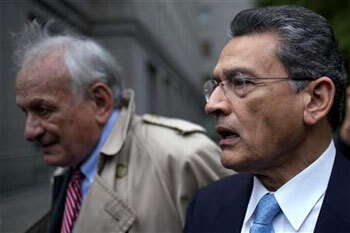 In a setback to India-born former Goldman Sachs director Rajat Gupta, the US Supreme Court on Monday rejected his appeal to overturn his conviction on insider trading charges and upheld his two-year prison term. The IIT and Harvard-educated 66-year-old former McKinsey head - currently serving a two-year jail term on insider trading charges in a federal prison in Ayer, Massachusetts - had appealed in the apex court against his 2012 conviction. Gupta had filed a reply in federal court here last week in support of his motion to vacate his sentence, saying his friendship with jailed hedge fund founder Sri Lankan national Raj Rajaratnam did not prove he received personal gain by passing on classified information. He was convicted by a jury of passing confidential boardroom information to Rajaratnam that ordered him to make $6 million in restitution to Goldman and pay a $5 million fine. Gupta - the highest-ranking corporate official to be convicted in the US government's multi-year probe of insider trading in the hedge fund industry - is scheduled to be released from prison in March, 2016. Today's ruling came after an appeals court upheld his conviction in March last year. In the March, 2014 ruling, the US Court of Appeals for the Second Circuit had said that it had considered all of Gupta's arguments on appeal and "found them to be without merit". Gupta suffered a setback in January this year too when the apex US court had denied his appeal of ruling by a lower court that had permanently banned him from serving as an officer or director of a public company. The Court of Appeals had last year imposed a permanent injunction prohibiting the former McKinsey head from serving as an officer or director of a public company, associating with brokers, dealers, or investment advisors, and further violating securities law. Gupta has been trying to overturn his conviction on insider trading and sought to set aside his conviction, citing the recent ruling by an appeals court in which it reversed the insider convictions of hedge-fund managers Todd Newman and Anthony Chiasson. In the landmark ruling, the Second Circuit court of appeals ruled that for an insider trading conviction prosecutors must show that a defendant received a personal benefit for passing illegal tips. Gupta's lawyers argued in court papers that the evidence presented at trial of a relationship between Gupta and Rajaratnam does not amount to "proof beyond a reasonable doubt of a quid pro quo agreement" as required by the Newman ruling, and "therefore, Gupta is actually innocent".